As a veteran myself, I know that disabled veterans often have transportation challenges and need home-based jobs. Military spouses often cannot find work in the places they are stationed. They move frequently, too, and need “virtual” jobs that can go with them. 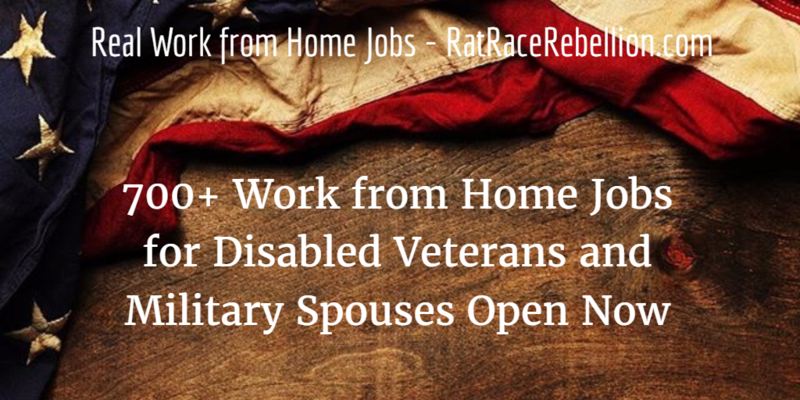 Here are over 700 work from home jobs for disabled veterans and military spouses available now. — Xerox’s [email protected] Program — Xerox has over 8,000 home-based employees. It hires veterans and military spouses for home-based jobs through its [email protected] Program. In the past year, the company says, it has hired customer care agents, image processors, data analysts, help desk specialists, systems developers, leadership roles and many others. It currently lists over 200 work from home jobs open now across the US. — Discover Bank’s “Military Work at Home Program” — Discover hires veterans and military spouses to work from home in customer service positions. Training is in Dover, Delaware. “The position is scheduled to start June, 2016 with a paid seven (7) weeks of training.” For details, click here. — The Military Spouse Employment Partnership (MSEP) and Work from Home Jobs – Over 200 companies have pledged to expand employment opportunities for military spouses through the MSEP. Several companies have hundreds of work from home jobs in total open now. These include Amazon, Dell, Sutherland and U-Haul. — Over 700 Work from Home Jobs with Aetna, Humana and Other Employers – Major companies like Aetna and Humana are hiring work from home employees now in a variety of roles. For details, click here. — 50 Part-Time Work from Home Jobs with Various Employers – Many disabled veterans and military spouses prefer part-time employment options. For 50 part-time work from home jobs open now, click here. Please share this post with your circle. Many disabled veterans and military spouses are unaware of these jobs. They will thank you, and we do too. ← “Work from Home Jobs” – In the Pot Business!